The Canadian Chekhov’s ninth book (after her recent triumphs Friend of My Youth, 1990, and Open Secrets, 1994) contains eight long stories that resemble Munro’s mature work in their tendency toward leisurely development and complex narrative. As always, their province is both the author’s native Ontario and the experiential territory denoted by the title of an earlier volume, Lives of Girls and Women (1973). The inchoate understanding possessed by husbands and wives whose intimacies never fully accommodate their unshared histories, siblings who have inevitably endured (or imagined) imbalance and unfairness, parents and children unhinged by the emotional variations to which their one flesh is susceptible—all are central to these elaborately woven tales of people’s disillusioning plunges into the depths of their own and others’ lives. But this time around the stories seem overloaded, distended by successive disclosures that move us unconvincingly away from their thematic and structural centers. In “Save the Reaper,” for instance, essential details about its characters’ relationships are withheld for so long that we never empathize sufficiently with the harried, lonely grandmother whose momentary impulsiveness endangers her family and herself. “My Mother’s Dream” reimagines from a daughter’s perspective—and in almost ludicrously melodramatic terms—her mother’s ordeal among her late husband’s controlling family. “The Children stay” overemphatically delineates the moral unraveling of an adulterous wife who unwisely makes “the choice of fantasy.” To be fair, a few of the stories are, even by Munro’s high standards, exemplary: notably “Cortes Island,” in which a bored housewife’s vivid imagination may or may not have exaggerated incriminating facts about her odd landlords; and especially the fine title novella, about the death of a small-town optometrist, the extremities to which well-meaning ordinary people are driven, and the burden helplessly shouldered by a “practical nurse” (there’s a lovely irony therein) caught between “Trying to ease people. Trying to be good” and telling what she wishes not to know. 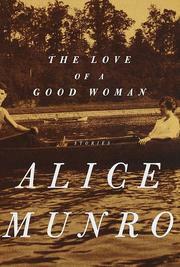 A mixed bag, then, through which we too often sense Munro straining to extend and intensify her stories. The unfortunate result is her weakest book yet.